Jessica Putnam-Phillips grapples with the medium of ceramics, one that is loaded with very specific meaning and associations. In her work, she attempts to the use the material of clay to carry a different meaning. 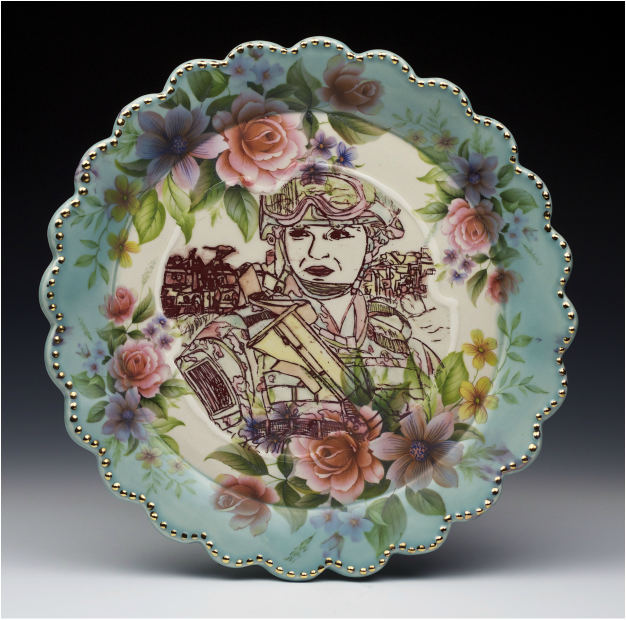 She takes the notion of serving – and uses the objects she makes, traditional heirloom platters, to depict women who serve in the military. This carries biographical weight as well, and is reflected in both the form and content. She upends associations with gender, those of domesticity and the military. As with many contemporary ceramic artists, Jessica is engaged in subverting the material itself. "The combination of a brilliant illustration skills, conceptual use of pottery, and modern themes have found Jessica Putnam Phillips huge art world success in 2015." -CFile 15 Potters to Watch in 2016. Don’t let the dainty florals and smooth finish of Jessica Putnam-Phillips’s porcelain creations deceive you – hiding between the delicately rendered flora are female snipers in fatigues and combat helmets, armed and ready to shoot. The ceramics most often frame close up of females in active combat. Their eyes are fixed on a point in the middle distance while their poses reflect a tense readiness. Phillips uses her craft to bring to our attention some important messages about gender, combat, and the life of a female soldier on duty.